Jews have lived in Egypt in great numbers since the 3rd century BC. In the aftermath of the 1948 Israeli War of Independence and the Suez crisis in 1956, most of Egypt’s Jews left. Today less than 20 Jews, all elderly, remain in Egypt. 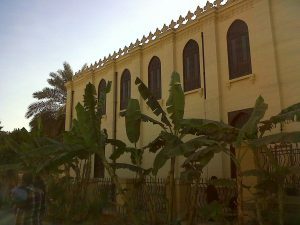 The 9th century Ben Ezra Synagogue, the synagogue of Moses Maimonides, famous for the Cairo Geniza, remains as a museum. During the winter of 2012, I was excavating at my site of Tell Timai in the Nile Delta. Tell Timai is the site of the ancient city of Thmouis, where there was a considerable Jewish population in the first century BCE and CE. When the Maccabean revolt broke out, the King of the Seleucids, Antiochus Epiphanes, was near Thmouis, in an expedition to defeat the Ptolemaic empire. The revolt caused him to leave Egypt and return to the Levant. In our excavation team were Jay Silverstein, a member of Sof Ma’arav, and several Jewish students. It is the tradition at Hanukkah to light the Hanukkiah and place it in a window so the candles can be seen. We decided that it would be more politic not to display the lights in a country that had expelled all its Jews and demonstrated anti-Israel and anti-Semitic attitudes, despite the peace treaty with Israel. The first night, Jay and I, and several students gathered in my rooms in the basement of our dig house in the village of Timai El Amdid to light the candle for the first night. The other non-Jewish students and staff heard what we were doing and by the fourth and fifth night, most of our students and staff, 12-13 of us, including non-Jews, gathered in my rooms, with the drapes closed, to light the candles and celebrate the holiday with us. We felt a bit like the Marranos of Spain, hiding our Judaism. That season was not the only Egypt-Israel connection. Jay was excavating in a Roman layer, about three meters deep, and found what he thought was a bronze metal-working workshop. After he cleaned the bronze, he discovered that the bronzes were in fact unexploded ordinance, live bullet shells. We doubted that the Romans had bronze bullets, and we later found that during the 1967 war between Egypt and Israel, there was a gun emplacement on the Tell, which shot down an Israeli plane. After the war, the gun emplacement was removed, and the area reburied – but live ammunition remained for us to discover. The ancient synagogue that surely was at Thmouis remains to be discovered.